Vietnam - the country known to produce some extremely fine qualities of rubies, sapphires, spinels, peridot, aquamarine, topaz, etc; it is gifted with some 70 gem deposits and 160 different occurrences (Huong et al, 2012). Present gem production includes ruby, sapphire, spinel, tourmaline, peridot, garnet, aquamarine, topaz, quartz, and green orthoclase. Rubies as well as spinels were first discovered in Vietnam in early 1990s and since then, they have been seen in the world market, though sporadic in nature. 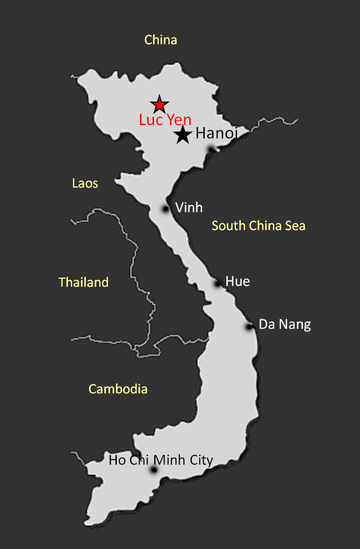 Vietnamese spinel was initially found at Luc Yen (Yen Bai Province) and Quy Chau (Nghe An Province), but today, Yen Bai is the only active source. The major deposits are located at An Phu, Khoan Thong, Minh Tien, and Truc Lau in Luc Yen, and at Tan Huong in Yen Binh. The newest deposit, found in February 2010, is Lang Chap, notable for its orange-red padparadscha-like stones (Nguyen et al., 2011). Yet the most productive spinel deposit remains the old Cong Troi mine in An Phu, which yields a wide range of colors (again, Huong et al, 2012). 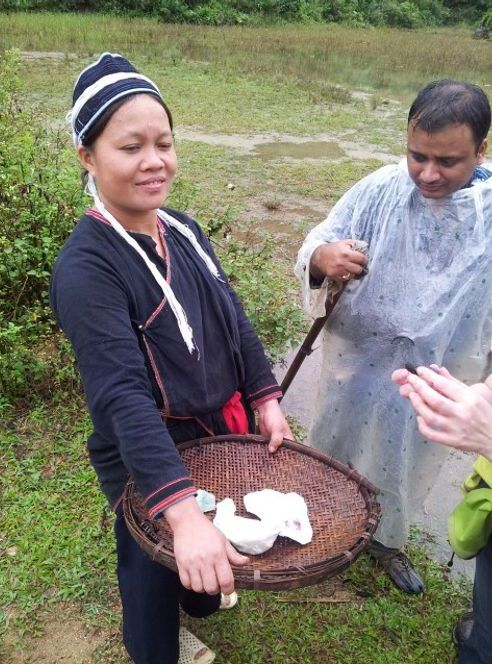 Recently, the author had an opportunity to visit the primary spinel mines of the Luc Yen district in Yen Bai Province of northern Vietnam, which intrigued the author to present this article. 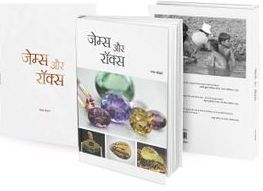 This article mainly is a pictorial representation of the situation at the mining area and does not cover hard-core gemmological / scientific analyses. Due to the continuous rain for all the three days of visit, the author could not see the mining activity in process, but freshly exploded rocks with outcrops of spinel, clinohumite and pargasite were quite evident of ongoing mining activities. Although, known for the red spinel, this deposit also produces pink, orange-red, violet, purple, and blue colours of spinel. The deposits of red spinel in Luc Yen District of Yen Bai Province are located at an elevation of approximately 620 Metres, and approximately 20 kilometres from the town of Luc Yen. The closest village to the mines is Khau Xen (22:00:55.15 N / 104:50:09.97 E) which is around 16 kilometres from Luc Yen Town and can be reached by motorable road, while the mines (22:01:58.72 N / 104:48:44.32 E) can be reached through a trek of around 4.60 kilometres; while we reached the Luc Yen town through 10 hours' drive from Hanoi, the capital of Vietnam. 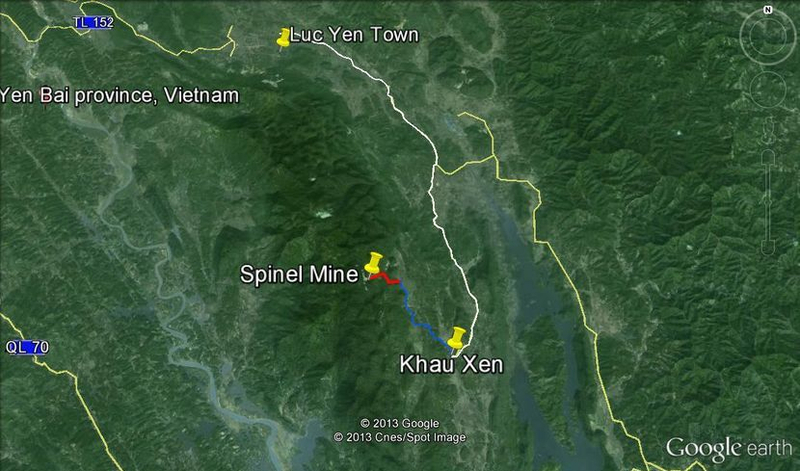 Google Earth image of Luc Yen District showing the location of spinel mines. The mines can be reached through a 16 kilometre drive from Luc Yen town to Khau Xen village (white path), followed by a trek of around 4.6 kilometres (blue and red paths), which include a steep mountainous path of around 1.2 kms (red path). On the way to the primary mines, there were also few secondary deposits being worked out by small-scale miners. They typically use water jet to soften the ground, which is transported to a wooden jig for washing, and hand picking. A closer look at the mining operation. Note the discarded pebbles at the bottom right corner of the image. Trekking in rain! A trek of around 1.2 kilometres through rocky mountains, muddy slopes and in rain was one of the most difficult parts of the expedition. And many of the participants just gave up! And this is what we saw...after the dangerous trek! A dense cover of mist, in which, we could not see even few metres. Note the white / gray rocks all over the slope. As a result of blasting, the broken rocks simply roll down the slopes which are then worked out to extract spinels. We saw a number of rocks where spinels were still embedded along with green pargasite and orange brown clinohumite. After few minutes, the mist was cleared up and we could see the white marble-mountain in the back drop with rolled down rocks. As per the locals, there are ruby deposits on other side of the mountain. A closer view of the rolled down white and gray marble rocks. A worked out host-marble rock to expose red spinel and green pargasite on the surface. At a local miner's house in Khau Xen village, the author had an opportunity to see a 2-ton marble rock with numerous crystals of ruby. A closer look of the ruby crystals. The size of few exposed crystals was as large as 10 centimetres in length. A local gem market is held in the town of Luc Yen every morning at 8 o' clock, where local production of gems and minerals is available for sale. Local villagers at the gem market. Note the collection of gems on their tables. Gems from Luc Yen! A closer look at the table displaying various types of gemstones. Also note crystals (left) of black tourmaline and tektite. Gems from Luc Yen! A colour range of spinels (red, pink, blue, violet, purple) on display, along with blue and pink sapphires and citrine (yellow). Luc Yen area also produces spinels in pink-orange colours, reminiscent of 'padparadscha' sapphires from Sri Lanka.